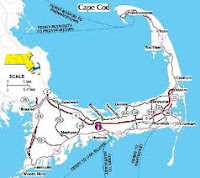 As Charlie always tells guests at our Cape Cod bed and breakfast, a trip along scenic and historic Route 6A can take 4 hours or 4 days, depending on how many times you stop along the way. Beginning in Sandwich and meandering along the Cape Cod Bay or north side of the Cape to Orleans, this bucolic road is among the most famous scenic drives in the country. It meanders past stately, historic homes, beautiful gardens, views of salt marshes, fields, cranberry bogs, many historic cemeteries, and gives you occasional glimpses of Cape Cod Bay. Whether it’s beautiful views you enjoy or antique shopping, art galleries, or quaint shops and restaurants, there are scores of tempting stops along the way. After you have enjoyed a hearty and delicious breakfast at the inn, hop in your car, open the windows, drive up Tupper Road to Route 6A, turn right and you are off on an exhilarating adventure. On the outskirts of Sandwich as you drive through East Sandwich you will pass Titcomb’s Book Shop, a favorite haunt of this innkeeper, and The Glass Studio of Cape Cod, owned and operated by Michael Magyar, one of Sandwich’s master glassblowers. Just up the road on the right you will see one of Cape Cod’s famous cranberry bogs. As you cross over the bridge at Scorton Creek, you will see kayakers moving about along the creek. On warm summer days at high tide, kids like to jump off the bridge into the water. 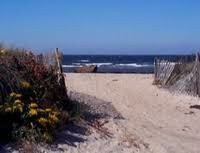 Take your time along here and enjoy this beautiful Cape Cod scenery. Momo’s Food Emporium will be on your right as you continue along 6A. 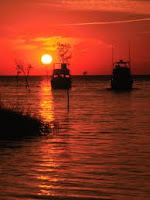 They have great marsh views and wonderful specialty food items. East Sandwich is small but has some wonderful boutiques if you feel like a little shopping. On your right will be Mrs. Mugs and across the street is a little group of shops including Lavender Moon, and Painted Daisies. Stop in and have a look and their beautiful gift items. Leaving East Sandwich, the drive through West Barnstable and into Barnstable Village is really beautiful. In several places, especially in the spring and fall months, you can see across the marshes on your left out to Cape Cod Bay. There are lovely old homes, art galleries, and shops all along the way. Claire Murray has a wonderful shop in West Barnstable. It will be on your left. You will love her hooked rugs and she now has a wonderful seaside style furniture line. If you are a quilter, keep an eye out for Tumbleweed Quilts at the intersection of 6A and Route 132 on the right. As you enter Barnstable Village, you will pass the Sturgis Library, Barnstable Tavern, the Coast Guard Heritage Museum, and many quaint shops. At the traffic light at the intersection of 6A and Phinneys Lane (Hyannis-Barnstable Road), you may want to turn left and head down to Barnstable Harbor. From the beach, you can see across to Sandy Neck Lighthouse, a definite photo opp. Mattakeese Wharf is on the harbor as is Osterville Fish Too, a great little fish house that is open in the summer months. As you make your way back to Route 6A, turn left and continue on through Barnstable where you will pass by Cape Cod Organic Farm (on your left just past Barnstable Village). This is one of a growing number of farms that can be found on Cape Cod. You will see several on your drive. Some have farm stands where you can check out seasonal fresh goodies. As you come to Bone Hill Road, you may want to take a left and follow this road down to the Audubon Long Pasture Wildlife Preserve. The drive into the preserve office will be down Bone Hill Road on your left. Here is a great place to spend a couple of hours. The views across to Sandy Neck Lighthouse are spectacular as is the walk through the preserve. If you don’t want to go all the way into the preserve, drive to the end of Bone Hill Road. There is a small parking lot and beach. If you picked up some tasty treats at a farm stand, here would be a wonderful place to have a snack and enjoy the view. Leaving Barnstable, you enter Yarmouth Port. If it is nearing lunch time and you would like a light bite or a cup of tea, the Optimist Café will be on your left. There are lovely shops, galleries, and historic sites in the Village of Yarmouth Port and the Old Yarmouth Inn is there. Some of the best sushi on the Cape can be found at Inaho Japanese Restaurant which is located in the heart of Yarmouth Port and will be on your right. 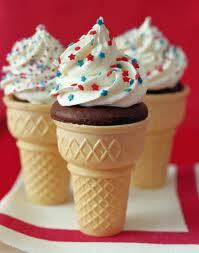 It is said that New Englanders consume more ice cream per capita than any other place in the country. The evidence of that is in the number of ice cream shops throughout the villages along scenic Route 6A. Stop at one and have a lick. As you leave Yarmouth Port and pass into Dennis, keep an eye out for the Antiques Center of Cape Cod. It will be on your right and is huge. This is a great place to spend a couple of hours. A bit further up 6A on your left as you get into Dennis Village is the Borsari Gallery and Tea Room, another of this innkeepers favorite places. Stop for a bite to eat or tea and pastries….YumYumYum and wonderful artwork. This is a converted meat-packing barn and a wonderful place to see. Dennis is a large village with many shops, restaurants, and galleries. The famed Cape Cod Museum of Art is located here. You could spend a lot of time in Dennis. 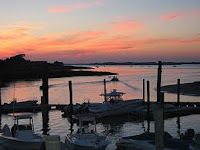 Another of our favorite places on Cape Cod is in Dennis; it is the Sesuit Harbor Café. We have written about our fondness for this place in many prior blogs. 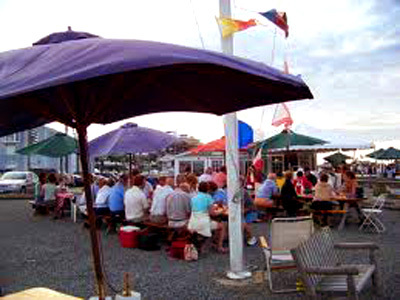 The seafood is great and the view unbeatable…quintessential Cape Cod. It is not easy to find, but if you turn left onto Sesuit Neck Road and follow it to the end, you will see the Town Landing on your right and just past that, you turn right in front of the Dennis Yacht Club and into the boat yard and follow the gravel road to the parking lot. They are only open during the summer months and serve lunch and dinner. It is a great Cape Cod experience. As you continue your drive on 6A and headed towards Provincetown, you will pass the Harvest Gallery and Wine Bar. It will be on your left and behind the Dennis Post Office. It is open from Thursday through Sunday and well worth the stop. The Red Pheasant restaurant is on the right side of 6A on the outskirts of the village. This is another great place for dinner. Charlie greatly admires their wine list. Scargo Lake, Scargo Tower, and Scargo Pottery are on Dr. Lord’s Road, which will be on your right as you drive along 6A. 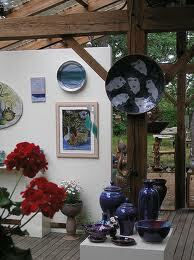 It is the oldest pottery studio on the Cape and features the work of seven resident artists. You can watch them as they work in the “open studio” environment. There are some really beautiful beaches In Dennis. Corporation Beach is off of Corporation Road. For Chapin Memorial Beach, turn off 6A to New Boston Road, to Dr. Bottero Road. To get to Mayflower Beach, from 6A turn on Bayview Road and take Dunes Road to the beach. There are many others but these have parking and public restrooms. You may want to stop at one for a bit and dig your feet into the sand, feel the warmth of the sun on your face, and breathe in the ocean air…now there is a calming moment. 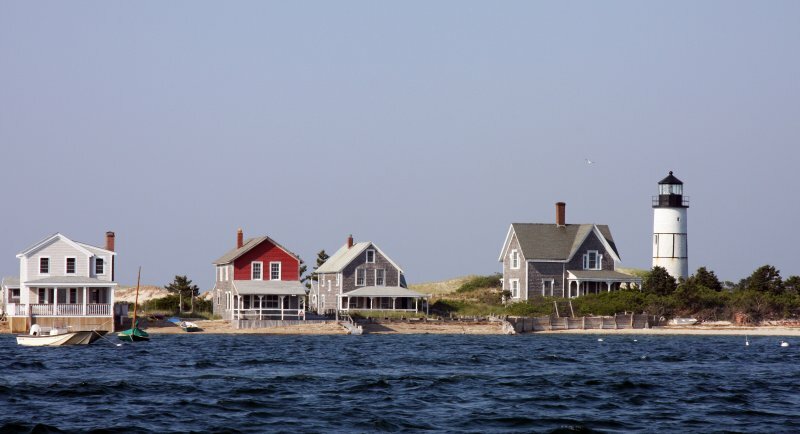 The next village you come to as you drive along scenic 6A towards Provincetown is Brewster. The Cape Cod Museum of Natural History is a great stop. It will be on your left. There is a nature museum and 80 acres of trails to walk and take in a little fresh ocean air. Not far from here on your left is a small group of unusual and interesting shops in an area called Lemon Tree Village. Among the shops are a great birdhouse store, a lavender shop, and a Cook Shop with wonderful things to buy for your kitchen. By-The-Bay gift shop is there and there is also a cute little café in case you need a snack. There are so many art galleries and quaint shops nestled into the flora and fauna as you drive through this area…so take your time and enjoy stopping along the way. 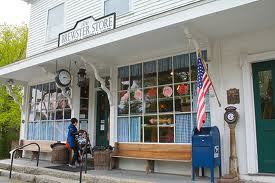 A place that is a “must visit,” is the Brewster Store. This is another of this innkeeper’s favorite places. It is right on 6A on the left. It is filled with wonderful things “you thought you would never see again.” Enjoy a cup of coffee and look around. You are sure to find something you can’t live without. Have an ice cream from the shop right next door before you leave this area. As you leave Brewster, Route 6A takes many turns and twists. You will pass under Route 6 (the Mid Cape Highway) and you may even notice signs calling Route 6A the Cranberry Highway, but it is still Route 6A. As you enter Orleans, you will find it to be quiet large with many, many shops, galleries, and restaurants. Take a ride over to Skaket Beach for a great sunset photo or a stroll along the beach. Off 6A take West Road to Skaket Beach Road. At low tide, you can walk out where the water has receded and play in the tidal pools and perhaps see some sea critters. As you continue on your 6A drive, you will come to Main Street in Orleans. Here you should stop and have a look around. There are so many cute shops and restaurants to check out. When you get back in your car, take Main Street towards Cape Cod Bay and down to Rock Harbor. Main Street actually becomes Rock Harbor Road. There is nothing like a Rock Harbor sunset. If you are lucky and the tide is right, you may get to see the fishing fleet return to the harbor. That is a sight you won’t forget so, if you go, make sure you have your camera. If you have taken a less leisurely drive along scenic 6A, you may have time to venture over to the ocean side of Orleans and to Nauset Beach. To get there from 6A, follow Main Street through East Orleans to Nauset Beach Road and take that to the beach. This is one of the largest and most famous beaches on all of Cape Cod. It attracts locals and tourists for swimming and surfing or just strolling along the shoreline. There are extensive facilities here and a large parking lot. There is a fee for parking. Orleans is where Route 6A runs into Route 6 (Mid Cape Highway) at the Orleans Rotary. If you have time you may want to along Route 6 through Eastham, Wellfleet, Truro, and to Provincetown. If you have had a leisurely drive and have made a lot of stops along the way, you may want to save the rest of this part of Cape Cod for another day of exploring. During your 6A Day, You may have seen just the perfect place that you want to stop off for dinner. If not, just head on back to our Sandwich bed and breakfast where we will have a complimentary glass of wine waiting for you. We will be happy to direct you to one of the fine restaurants in Sandwich where you can end your day with some great local cuisine.